This is a non-political site and does not subscribe to any revisionist organizations and neo-nazi beliefs. Read more here! German, Dane, Finn, French, Dutch, Norwegian, Hungarian, Rumanian and Estonians. Fate Annihilated in Berlin April/May 1945. 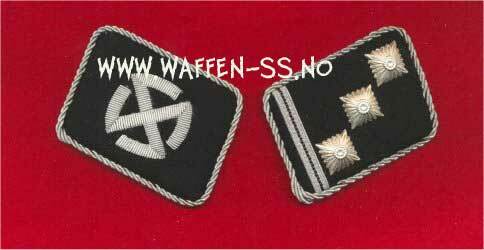 The 11th SS Volunteer Panzergrenadier Division Nordland was a German Waffen SS mechanised infantry division recruited from foreign volunteers. It saw action on the Eastern Front during World War II. By 1943, the foreign legions of the Waffen-SS had proven their worth in battle many times over. 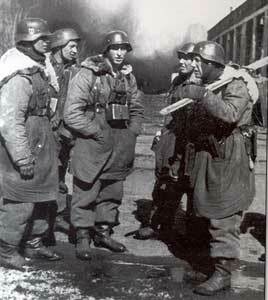 The 5th SS Panzergrenadier Division Wiking, a volunteer division, had been in action since 1940 and had amassed an impressive combat record. However, the Wiking, whose enlisted men were predominantly Nordic volunteers, was officered by Germans. In February 1943, Hitler ordered the creation of an SS Division which would be officered by foreign volunteers. The Wiking's SS-Panzer-Grenadier-Regiment Nordland, a Scandinavian volunteer regiment, was pulled out of the line to be used as a basis for the new division. The division was originally to receive the name Waräger (Varangians) but the name was rejected by Hitler himself. 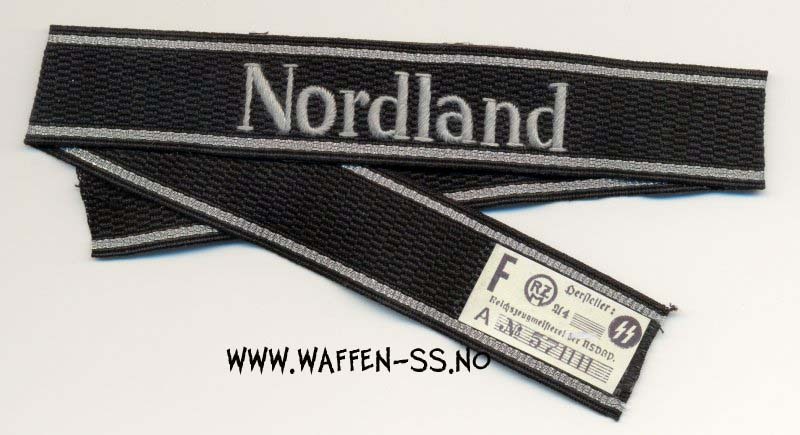 It was decided that the division was to continue using the already-existing regiment’s name, Nordland. The Nordland's two Panzergrenadier regiments were also given titles. The regimental titles were a reference to the location where the majority of the regiment's recruits were from, SS-Panzergrenadier Regiment 23 Norge (Norwegians) and SS-Panzergrenadier Regiment 24 Danmark (Danes). Despite most volunteers hailing from Scandinavia, the Nordland carried the widest range of nationalities found in any single division. By the end of the war, Danish, Hungarian, Dutch, Norwegian, Estonian, Finnish, French, Romanian, Spanish, Swedish, Swiss and British volunteers had either served in the division or been attached to it. After its formation in Germany, the division was attached to SS-Obergruppenführer Felix Steiner's III (Germanic) SS Panzer Corps and was moved to occupied Croatia for training and to complete its formation. Soon after its arrival, the SS-Freiwilligen-Legion Niederlande was attached to the division and it began combat operations against Josip Tito's partisans. In late November, the Danmark regiment was involved in heavy fighting with a force of 5,000 partisans near Glina. During this period, the Nordland's Panzer Abteilung, SS-Panzer Abteilung 11, was given the honour title Hermann von Salza in honour of the fourth Grand Master of the Teutonic Knights (b.1179-d.1239). In January 1944, orders were received to move the division to the Oranienbaum front near Leningrad, under the command of Generalfeldmarschall Walter Model's Army Group North. Nordland, along with the rest of III (Germanic) SS Panzercorps arrived at the front near Leningrad and was almost immediately put into action against Russian attacks to break the German encirclement of the city. After the encirclement was broken, the Nordland effected a 60 kilometer fighting withdrawal to Oranienbaum. On the 14th of January, a Soviet assault succeeded in collapsing the German front, and the Nordland again fought its way back to the city of Narva in Estonia, where a new line of defence was being organised. In early February, the Soviets began their attacks towards the city and the Battle of Narva began. The Battle has come to be known as the Battle of the European SS because the majority of the defenders were European volunteers. Joining the Nordland were the formations from all over Europe. The Walloons of the 5th SS Volunteer Sturmbrigade Wallonien, the Flemings of the 6th SS Volunteer Sturmbrigade Langemarck, the Estonians of the 20th Waffen Grenadier Division of the SS (1st Estonian), the Dutchmen of the 4th SS Volunteer Panzergrenadier Brigade Nederland as well as regular German formations. Altogether, the defenders of the Narva River line amounted to 50,000 men. Against them, the Soviets threw 200,000 men of the Leningrad Front. The original attack was launched on February 13th, with the Soviets attacking right across the line, as well as launching an amphibious assault from the Baltic near Mereküla. The Nordland annihilated the Soviet landing force. Over the next five months, the European SS held against the Soviet attacks, the Nordland seeing very heavy fighting. In March, the Soviets managed to destroy the Narva Bridge, cutting off the troops on the far side of the river. The men of Nordland's Pioneer Battalion quickly rebuilt the bridge while under heavy fire. The launch of Operation Bagration in June 1944 resulted in Army Group North becoming trapped in the Kurland Pocket. After months of heavy fighting, the Hermannsberg bridge over the Narva was blown and the defenders were moved 25 kilometers west to the Tannenberg Line. The Tannenberg Line anchored on three strategic hills. Running west to east, these were known as Hill 69.9, Grenadier Hill and Orphanage Hill. From Orphanage Hill, the rear side of the town of Narva could be protected. From 27 July, Nordland fought alongside Sturmbrigade Langemarck and Kampfgruppe Strachwitz from the Grossdeutschland Division to keep control of Orphanage Hill. Despite the death of the Nordland's commander, SS-Gruppenführer Fritz Scholz, who was killed in the fighting, and the subsequent deaths of the commanders of Norge and Danmark regiments, the division grimly held onto Orphanage hill, destroying 113 tanks on July 29th. On the 4th of August, men from Penal Company 103, a punishment company, were reinstated and absorbed into the Danmark regiment. The III (Germanic) SS Panzer Corps bled itself white defending the Tannenberg Line, until on September 16th it was pulled back into Latvia to defend the capital, Riga. Riga fell on 12 October, and by the end of the month all Waffen SS units had been withdrawn into what was known as the Kurland Pocket. From late October to December 1944, the Nordland fought fierce defensive battles in the pocket, and by early December the divisional strength was down to 9,000 men. In January 1945, the division was ordered to the Baltic port of Libau, where it was shipped out of the pocket to Pomerania. The division disembarked at Stettin, with the Panzer Abt Hermann von Salza being sent on to Gothafen for refitting. In late January, Nordland was assigned to Steiner's 11th SS Panzer Army, which was now forming in anticipation of the defense of Berlin. In early February, the refitted Panzer Abt returned to the division, and a trickle of reinforcements began arriving. Among these units was the British Free Corps, a British Waffen-SS formation. On February 16th, the division was ordered on the offensive as a part of Operation Sonnenwende, the operation to destroy a Soviet salient and to relieve the troops besieged in the town of Arnswalde. The offensive had been conceived by Generaloberst Heinz Guderian as a massed assault all along the front but had then been reduced by Hitler to the level of a local counterattack. Initially, Nordland's attack achieved a total tactical surprise and the division soon advanced to the banks of Lake Ihna in all sectors. However, as the Soviets realised what was happening, resistance grew stiffer and the advance began to slow. On the 17th, the division reached Arnswalde and relieved the exhausted garrison. Over the next few days the town was secured and the surviving civilians were evacuated. Soon, however, strong Soviet counterattacks halted the divisions advance, and Steiner called off the attack, pulling the III (Germanic) SS Panzer Corps back to the Stargard and Stettin on the northern Oder River. By the 21st the conclusion was made that no more useful gains could be made against an increasingly powerful enemy without undue casualties so Steiner ordered a general withdrawal back to the north bank of the Ihna. Between the 23rd and 28th III (Germanische) SS-Panzerkorps made a slow withdrawal to the area around Stargard and Stettin on the northern Oder River. The Soviet offensive of 1 March pushed Nordland along with the rest of the depleted III (Germanic) SS Panzerkorps before them. In a desperate fighting withdrawal, the Nordland and the rest of III (Germanic) SS Panzerkorps inflicted heavy casualties on the Soviets, but by March 4, the division was falling back to Altdamm, the last defensive position east of the Oder itself. During the next two weeks, Nordland grimly held to the town, inflicting and suffering high casualties. On the 19th, the battered defenders fell back behind the Oder, the Danmark and Norge regiments had fought virtually to extinction. The division was ordered back to the area west of Schwedt-Bad Freinwalde for a refit. During this time, the 33rd Waffen-Grenadier Division of the SS Charlemagne, a 300 man unit of French SS volunteers and the Spanish Volunteer Company of the SS No.101, a company of Spanish SS men were attached to the division. The division's strength was replenished with the addition of several vehicles and some personnel from the Luftwaffe and Kriegsmarine. On April 16, Nordland was ordered back into the line east of Berlin. Despite recent replenishment, the division was still grossly understrength and, with the exception of the French and Spanish, many of the new recruits had little if any combat experience. throughout the 17th to the 20th of April the division was involved in constant combat all along its front, pushing the division back into the city itself. By the 22nd, the Nordland had been pushed back to the Tiergarten in the centre of the city. During the next few days, the division ceased to exist as a cohesive unit. The remains of Norge and Danmark Regiments, along with elements of the Pioneer Battalion, found themselves defending the bridges across the Spree. After a spirited but futile defence, the remnants of Nordland were pushed back into the Government District. Meanwhile, the main Soviet assault was towards the Treptow Park area, where the rest of the Pioneer Battalion and the few remaining Panzers of Panzer Abt Hermann von Salza were defending. SS-Obersturmbannführer Kausch led the few tanks and armoured vehicles in a counterattack and succeeded in halting the enemy advance, at the cost of his last vehicles. By the 26th, the defenders of the government district had been pushed back into the Reichstag itself, and were causing heavy casualties to the advancing Soviets. For the next few days, the few survivors of the division held out against overwhelming odds. On 30th April, the divisional commander received news of Hitler's suicide and ordered those who were able to break out to the west. Several small groups managed to reach the Americans at Charlottenburg, but many more did not, among them the 3rd (Swedish) Company of the Reconnaissance Abt who fought a desperate and ultimately useless battle to escape the surrounding Russians. By 1 May, the Soviets had cleared the Reichstag and destroyed all organised resistance. The few survivors of the Nordland who surrendered to the Russians were sent east, most never to be seen again. Of the few survivors who reached the Allied lines, most were handed over to their respective countries and tried as traitors, serving prison time and a few even receiving the death penalty.